I’ve always thought that painting and cooking have a lot in common. Haven’t you noticed that most painters are great cooks? Because I love to cook, I’ve been giving this idea some thought over the past couple of weeks. Ingredients in the kitchen are like colors on the painter’s palette. Cooks combine ingredients to please the sense of smell, taste and sight, with an eye toward balance, harmony and composition of the meal. Do you remember the phrase “we eat with our eyes”? For the cook, everything must be edible, except for the framing (plates, place settings, etc). As in painting, the framing and presentation can be very important in the enjoyment of a meal. Painters play to the sense of sight with color, balance and composition. Just like cooks, some painters restrict themselves to a limited palette of materials, whether for health or aesthetic reasons. On a painter’s palette nothing is edible to the stomach, but on the other hand can be enjoyed by the eye over and over again. In fact it sometimes takes months and years to truly digest the significance and beauty of a painting. 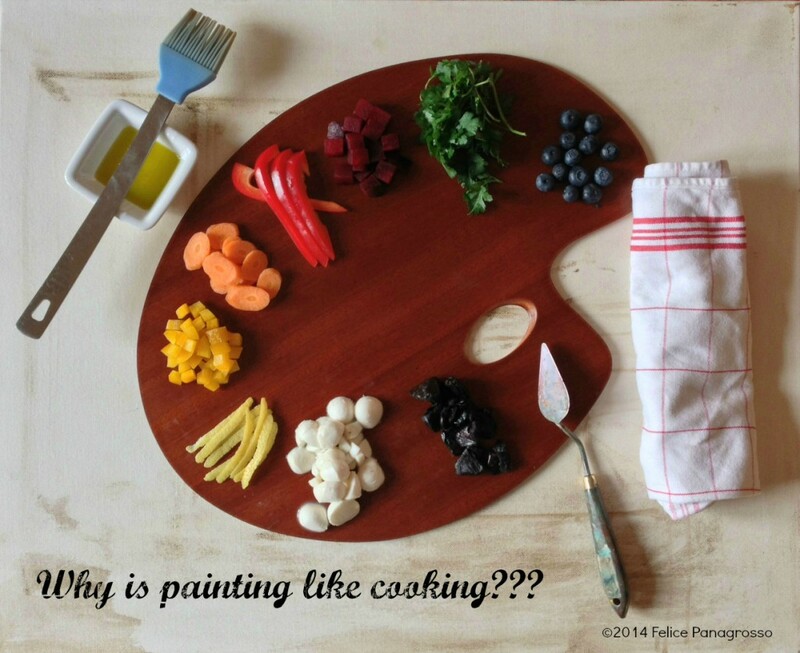 Both painters and cooks use the terms luscious, intense, lively, fresh, juicy and colorful. Both are artists, interpreting and sharing with others the beauty of nature. PS The “colors” in the palette above are clockwise from the bottom: fermented black beans, mozzarella balls, lemon zest, yellow peppers, carrots, red peppers, beets, parsley and blueberries. Olive oil is in the square bowl. Absolutely with you on this one Phil. I often think about it with my musicking: there’s so many similarities with my approach to playing in the kitchen and playing in the music studio. Selecting and combining sound sources (ingredients), compositional structures, harmonising, balancing framing and garnishing… and that very crucial issue of timing else it can all go awry! Did you take that photo? Love it! And so true, all forms of creativity (as Helen pointed out), involve imagination, curiosity, combining, trying new things, for the sake of capturing an image, or a feeling, or a flavor, pleasing, challenging, shocking our different senses…it’s an honor, or a gift (I would say blessing, but I don’t want to get religious about it:), to be able to express creatively. Hi Marylou, Yes, I did set it up and take the photo myself. With a bit of advice from Caryn, so I guess I would add collaboration to the list. Thank you, I’m glad you like it.